Everyone should be able to enjoy a day out at the beach! What is an Inclusive Beach? In 2016 we set about designing solutions and processes so that people who couldn’t access and participate on beaches in NI would be empowered to do so. We gave ourselves a target of creating inclusion on at least one beach in each beach operating council area. Thanks to partnership with council and support from funders, we are now #CreatingChangeTogether. The summer of 2019 should see 3 out of 4 council areas become operational. 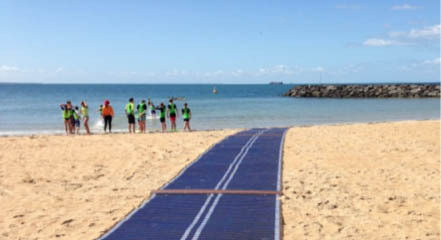 An Inclusive beach is a barrier-free environment where people of differing ability, who have been excluded until now, can come along and take part. 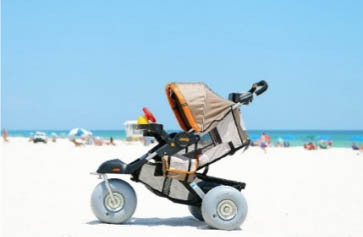 All beaches will have beach mobility equipment available to pre-book free of charge. Operating seasons, schedules and equipment options will differ from beach to beach. Please note: beaches are not yet operational for the season. 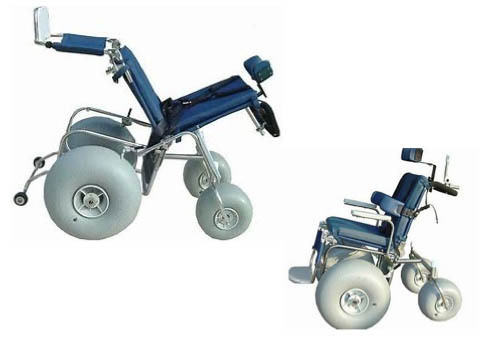 We ensure we address toileting need, hoisting requirements, adult changing bench facilities, wheelchair vehicle unloading areas, temporary walkways and accessible beach mobility equipment storage points. If you find you have a need we haven’t thought of, please get in touch! Please note, unfortunately we have withdrawn the Splashy seat from our loan scheme. We are currently seeking an alternative option, so please bear with us. Special thanks to Wooden Spoon, the Children’s Rugby Charity, SportNI and the Department of Agriculture, Environment & Rural Affairs for funding these inclusive beaches. 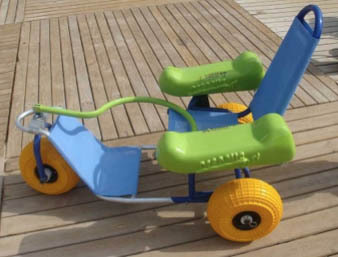 Thanks also to BBC Children in Need who funded our first beach wheelchair and our Sit-down Surfboard – which families can access during our special event days. 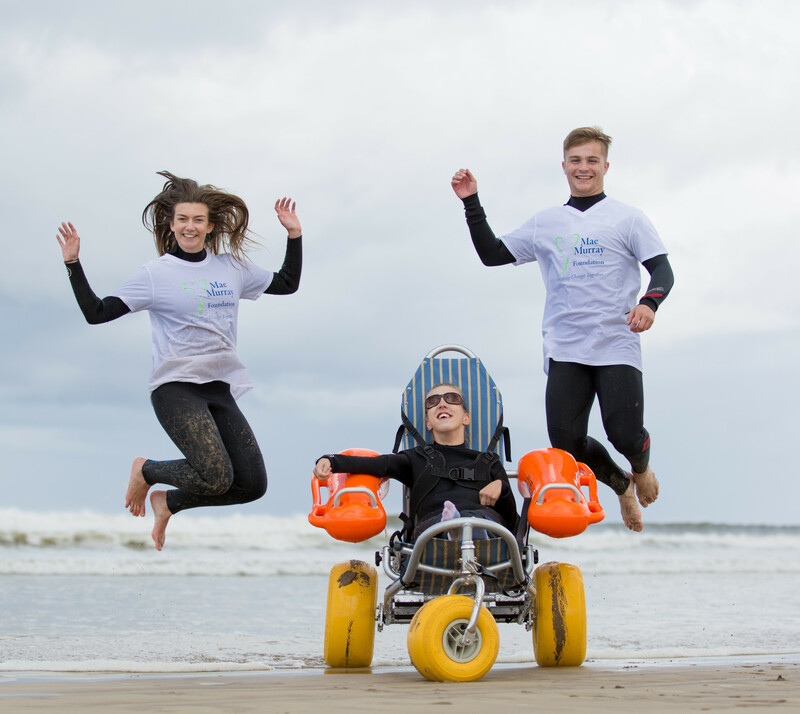 This amazing piece of kit, designed by a team from the national charity Cerebra, together with their advisors in Wales, means surf can now be accessed by people with a range of physical ability. Check out our Frequently Asked Questions, beach schedules and range of equipment below. The online booking request form is at the bottom of this page. 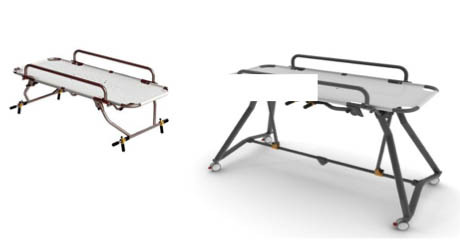 Have a look at our video’s (pictured below) to see the equipment in action. 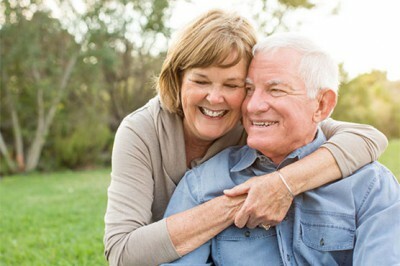 Ensure you have membership of Mae Murray Foundation – which is free! Click here. Check beach schedules and equipment options for your preferred beach. If unsure about which piece of equipment is best for you, contact MMF office. Complete online booking request form. NB You must send your request at least 72 hours in advance. Await confirmation email with further instruction. If no email is received contact Mae Murray Foundation office on 0300 600 1166. YES YES Wall-mounted, height-adjustable bench planned. YES YES Ceiling hoist planned. Can equipment be pre-booked? It’s essential to pre-book to avoid disappointment. Follow the 5 step process at www.maemurrayfoundation.org/projects/hands-up/ Bookings go directly to Council. Please give a minimum of 72 hours notice to enable council to respond with availability or confirmation. The person named on the membership card is responsible for its use, so must make the booking. This named member is responsible for equipment issued under the membership card, including ensuring that anyone using the equipment is equipped to do so safely and stay with Terms and Conditions of Use. Can I simply turn up at the beach? We don’t recommend that you do this as we cannot guarantee that equipment will be available or that council staff will be onsite. How do I know if equipment will suit my needs? Will help be available? 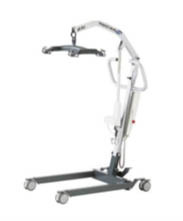 Descriptions of equipment can be found on our website. Should you have any further questions or are unsure which equipment may suit your need, please call Mae Murray Foundation on 03006001166 Mon-Fri 10am-4pm to enquire about attending an equipment demonstration day. Council staff on duty can demonstrate the features of equipment but cannot assess suitability of equipment for need nor assist you with any lifting, handling or transfer requirements. Council staff cannot adjust equipment. 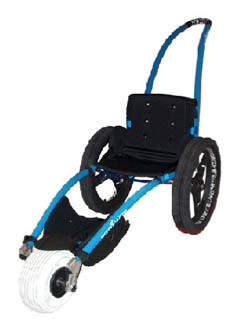 Equipment users/members must have an adult helper to assist with transfers and pushing of chairs where needed. Helpers must be fit enough to push the chairs across the sand. Flat footwear is recommended. Two helpers are required to enter the sea – using floating chairs only and when lifeguard is on duty. Its essential for helpers to watch online water safety video. 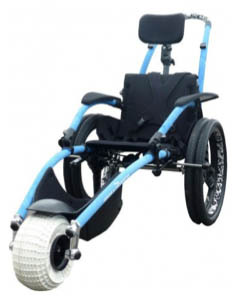 Personal wheelchairs or walking aids should be stored in car. How must does it cost? 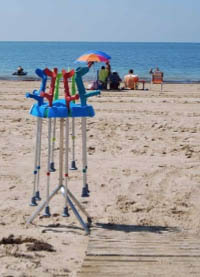 We want beaches to be accessible so do not make a charge for loan of beach equipment. However, the scheme is maintained by Mae Murray Foundation, a non-profit organisation, registered with the Charities Commission N.I. so donations are very welcome to enable us to maintain, improve and extend our services. You must present your Mae Murray Foundation membership card at the beach. The person named on the card is responsible for ensuring anyone borrowing and using the equipment is equipped to do so safely. When can I use the equipment and how do I stay safe? The scheme operates a changing timetable all the year round and varies from beach to beach. Floating chairs are also dependent upon lifeguard presence. Please note, some chairs are for use on the sand only, others are for use in the water. Details are listed on our website. Floating chairs can only be used when RNLI lifeguard is on duty within the RNLI lifeguard safe yellow/red flagged patrol area, which can be pointed out by council staff upon request. Extreme care must be taken. If using a floating chair, it is compulsory to watch the online water safety video before use. 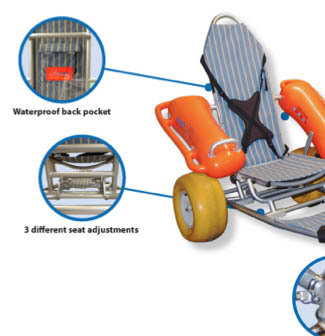 STRAPS MUST BE UNDONE AND SECURED OUT OF HARMS WAY BEFORE ENTERING THE WATER. PULL STRAP SHOULD BE UNCLIPPED AND PLACED IN VELCRO POUCH ON REAR OF CHAIR. 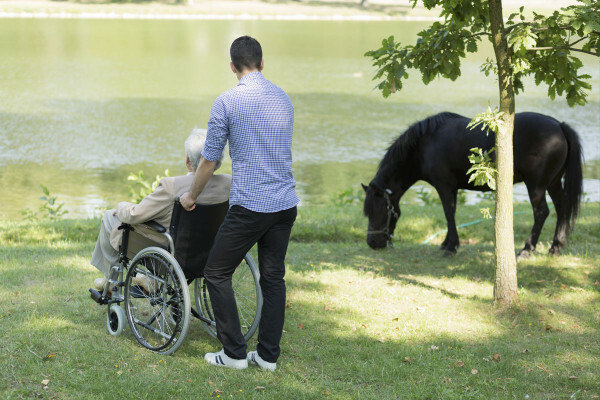 You must have a minimum of two adult helpers with you to ensure safe positioning is maintained. Please be aware of current sea conditions and understand that these can change at any time. Do not enter the water if it is not calm. RNLI guidance takes precedence at all times. Please note, buoyancy aids are essential and wetsuits are strongly recommended if entering water. If you do not have your own, then you should investigate hire options before arriving at the beach. Mae Murray Foundation does not hire/provide buoyancy aids – you must organise yourself. If you are not equipped, do not enter the water. Even when cloudy it’s possible to get burnt so please do use sun protection. The wind can be very cold so please make sure you have plenty of warm clothing or a change of clothes in case it rains. Where is the equipment located? Benone: The Ark (amenity block), Benone Beach, Limavady. Cranfield: Amenity Block, Cranfield Beach, West Kilkeel, Co. Down. Beach Groomsport: Amenity Block, Groomsport Beach, Bangor. Is a hoist available? Benone Beach & Cranfield Beach: Yes, we have a portable hoist onsite to assist with transfers where this is needed, but it is essential that you bring your own sling. Council staff are not permitted to operate the hoist, attach your sling, nor are they permitted to execute the actual transfer or assist with any lifting or handling – so please don’t ask. It remains the member’s responsibility to provide the sling, ensure that it is correctly attached to the spreader bar, is appropriate for use and that accompanying care/family member is competent to operate. Written consent/disclaimer will be required before use. Groomsport: An overhead hoist is located within the changing places toilet. 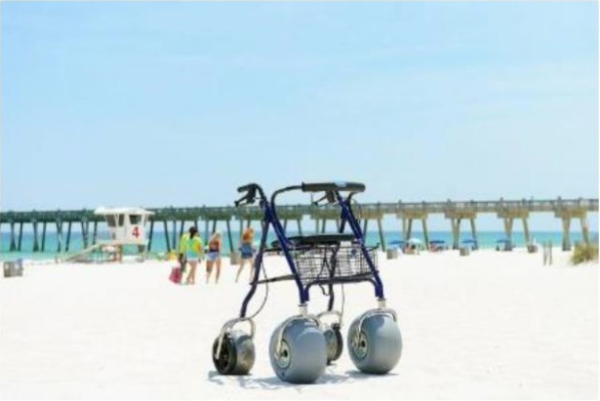 Will there be accessible walkways on the beach? Some of our inclusive beaches have temporary walkways stored onsite. These are not deployed every day. 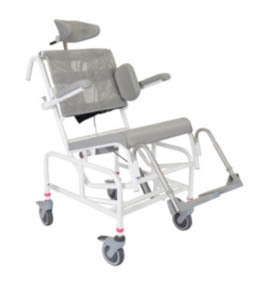 Groups and organisations (who are members of Mae Murray Foundation) can request that these be deployed to accommodate their group – but this request is subject to council having staff available to facilitate. Requests to deploy walkways MUST be made a minimum of two weeks in advance. Where can the beach equipment be used? 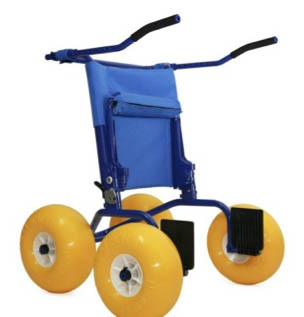 Our equipment may be used on the beaches and to/from the toilet block. It is not permitted to leave the boundary. What if I need to cancel? If you wish to cancel your booking please email info@maemurrayfoundation.org as soon as you can so that equipment can be reallocated. Members who book but repeatedly fail to turn up or cancel will have their advance booking facility withdrawn. Comments and Feedback This project is the first of its kind in Northern Ireland so please help us understand what we are doing well and also how we can improve, so that your day out at the beach can be as fun and as stress-free as possible. Please complete a ‘beach equipment’ comments form at the beach or you can email us any comments from the Contact Us page on our website. UPCOMING EVENTS – become a member to receive notifications directly to your inbox. Help us create change together -Share this page to Facebook! 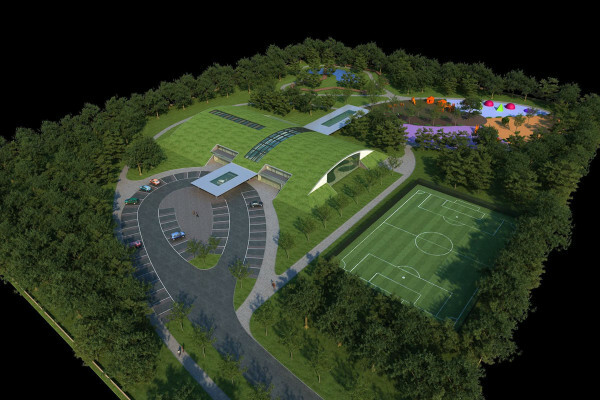 We want to create an environment suited to the complex needs of individuals of all ages and abilities within society.